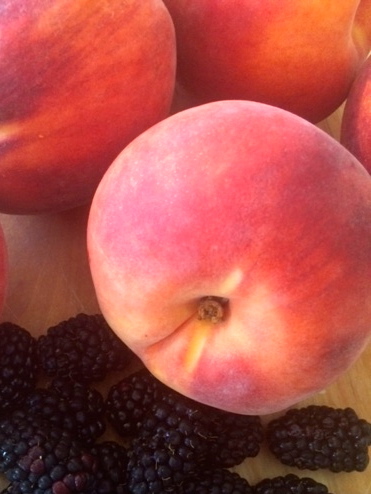 Peaches have been popping up everywhere lately, in grocery stores, farmers markets, fruit stands…you name it! They are fuzzy, sweet and one of my favorite seasonal fruits. 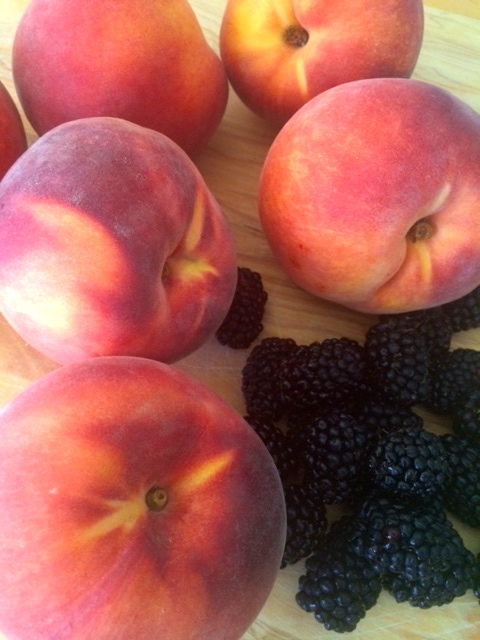 Turn them into scrumptious pies, a flavorsome cobbler, or just eat them plain for a delicious summer time treat. Over the weekend, my local farmers market was filled with baskets and baskets of peaches, and I couldn’t resist buying a bunch. Now I had to find something to make with my latest basket of farmers market goodies. Later that weekend, browsing through the Southern Living Magazine website, I discovered this Blackberry Peach Cobbler with Praline Pecan Streusel. Instantly, I knew what I was going to make with all of those peaches I bought over the weekend. 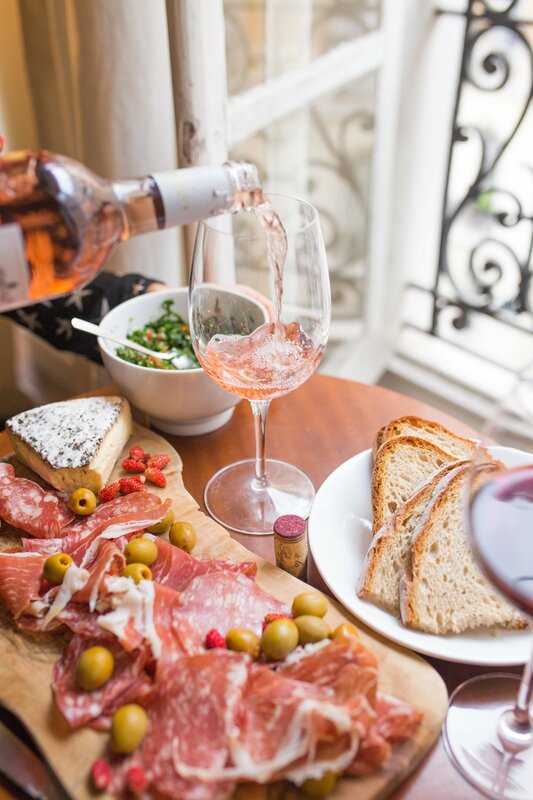 If you’ve been following my blog for a while you know dessert is by far my favorite meal, and I often say that I have more than one sweet tooth. Fruit desserts are best when the produce you’re using is at its ripest, so you want to wait until it’s their season to shine. 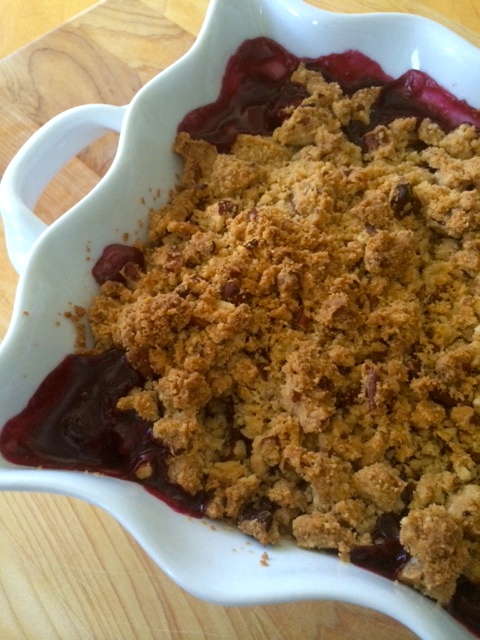 Now is the time to use those peaches that are filling our stores and markets, and this Blackberry Peach Cobbler with Praline Pecan Streusel will do just that. I was looking for a traditional peach cobbler with a bit of a twist, and this is exactly what this Southern Living specialty is. A base of sweetened, ripe full-flavored sliced peaches, and blackberries are topped with a praline pecan mixture, that makes a deliciously decadent cobbler. Bake this indulgent dessert until the crumbled oats are golden crisp and the filling is bright and bubbly. This summer specialty will fix even the sweetest sweet tooth. 1. Prepare Streusel: Stir together first 3 ingredients in a large bowl; add flour and pecans, and stir until blended. Let stand 20 minutes or until mixture is firm enough to crumble into small pieces. 2. Meanwhile, prepare Filling: Preheat oven to 375°. Stir together peaches and next 3 ingredients in a large saucepan; bring to a boil over medium-high heat. Reduce heat to medium, and boil, stirring occasionally, 6 to 7 minutes or until juices have thickened. Remove from heat, and stir in blackberries. Spoon mixture into a lightly greased 9-inch square baking dish. 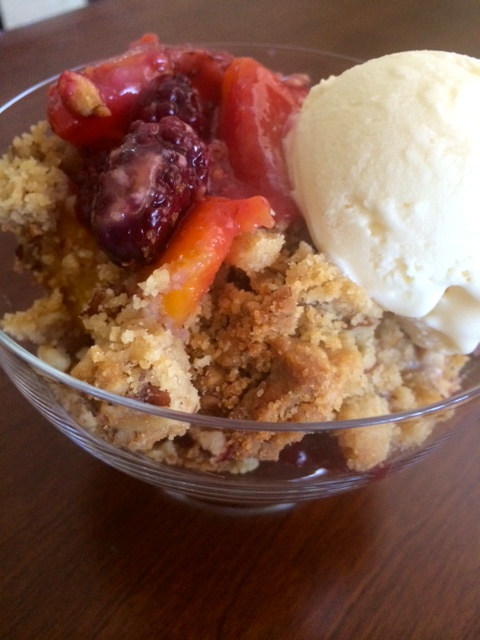 Crumble streusel over hot peach mixture. 3. Bake at 375° for 30 to 35 minutes or until bubbly and golden brown.